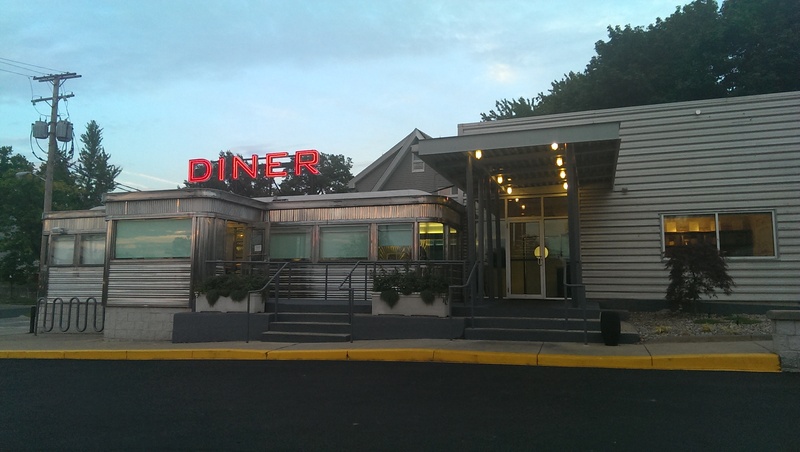 When the Katz Club Diner Bar Car burned down many of us thought that would be it for the lovely old-fashioned diner cars on Lee Road. After the arsonist was incarcerated, Doug Katz focused his energy on rebuilding. They tore down the bar car, which was a total loss, and landscaped the area. He had originally bought the cars for the spacious kitchen, so I wasn’t surprised to hear he was going to use the space for his catering gigs as well as hosting pop-up dinners. His pop-up dinners have been quite popular so far, so it seems like a great decision on his part. He has hosted a Vegetarian pop-up, Indian Street Food pop-up and Fried Chicken and Corn on the Cob pop-up, to name a few. 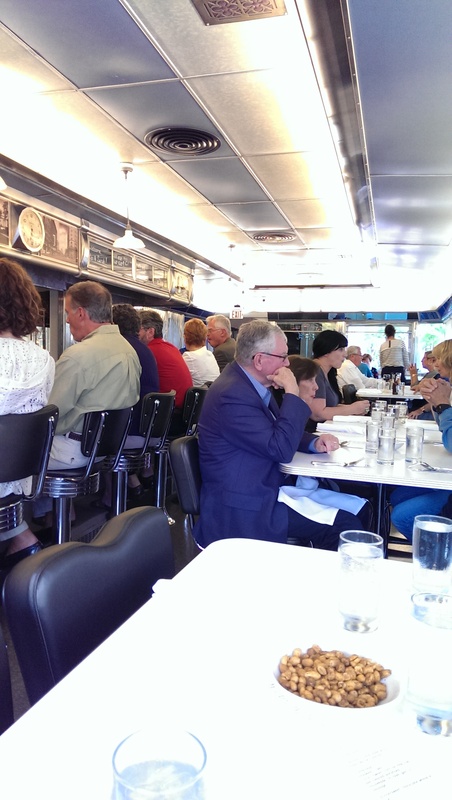 I have attended the Lobster Rolls & Blueberry Pie pop-up and the Clambake pop-up so far. I am also looking forward to several upcoming pop-ups including an Oktoberfest, Spaghetti & Meatballs, a French Bistro, and Dim Sum. The food is amazing from start to finish. There hasn’t been a bad choice yet. He elevates even simple smashed potatoes into something delicious. The dinners include tax and gratuity. Beverages are a la carte, and there are several wines and beers as well as a featured cocktail and some sodas to order separately. 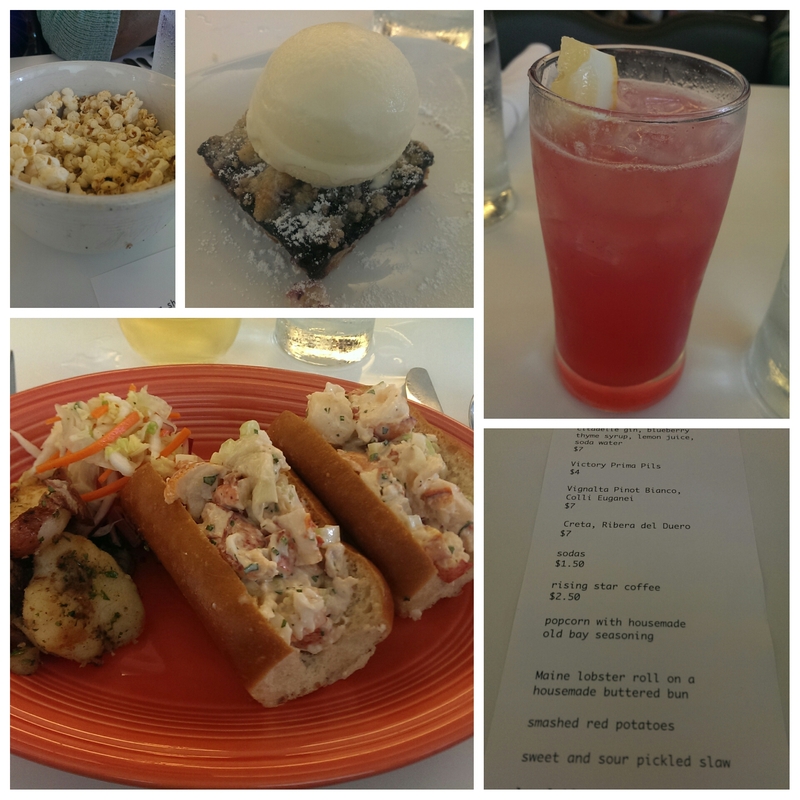 The first pop-up I attended, entitled Lobster Shack, featured popcorn spiced with housemade old bay seasoning, Maine lobster roll on a housemade buttered bun, smashed red potatoes, sweet and sour pickled slaw and local blueberry pie with housemade vanilla ice cream. I loved the Blueberry Thyme Collins, which was the cocktail selection for the evening. The blueberry thyme syrup was refreshing paired with gin, lemon and soda water – and I’m not normally a fan of gin. The lobster roll made me swoon. The bun had the perfect amount of butter and was an ideal carrier for the lightly tossed lobster filling. The smashed red potatoes and pickled slaw were great accompaniments. The pie – although not actually pie but more of a buckle – was delicious, as was the homemade ice cream. 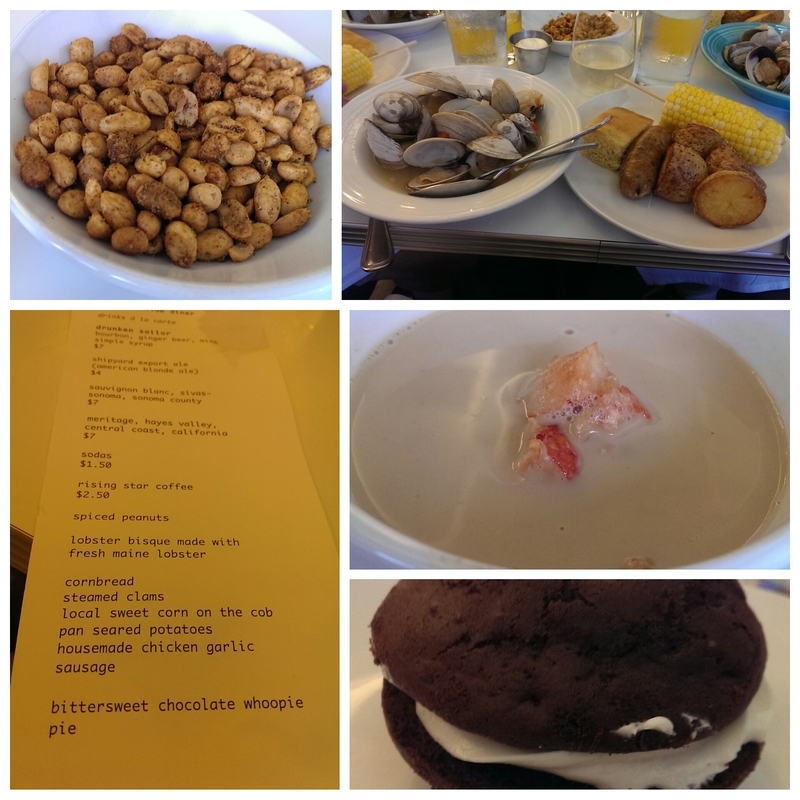 The most recent pop-up featured spiced peanuts, lobster bisque made with huge chunks of fresh Maine lobster, corn bread, steamed clams, local sweet corn on the cob, pan seared potatoes, housemade chicken garlic sausage and a bittersweet chocolate whoopie pie. Although I loved every course, my favorites were the bisque and that amazing whoopie pie, but even minor sides like the cornbread and simple pan-seared potatoes were sublime. I enjoyed the sparkling clementine soda to start and a Sauvignon Blanc with my meal. 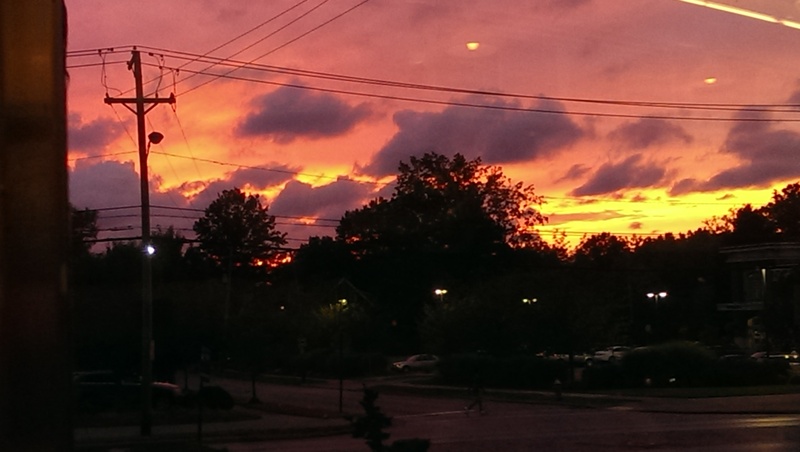 We also got to enjoy an amazing sunset. You can buy tickets for the upcoming pop-ups here and keep an eye on their Facebook page for announcements when the next pop-up is available to book. Tickets go on sale about one month beforehand and have sold out quickly, so act fast.